Hamedan area has located in the Sanandaj-Sirjan belt in the west Iran. Geomorphic indices of active tectonics are useful tools to analyze the influence of active tectonics. These indices have the advantage of being calculate from Arc GIS and remote sensing packages over large area as a reconnaissance tool to identify geomorphic anomalies possibly related to active tectonics. This is particularly valuable in where relatively little work on active tectonics based on this method was done, so this method is new and useful. Six geomorphic indices were calculated in the study area. Through averaging these indices we obtain index of active tectonics (Iat). The values of the index were divided into classes to define the degree of active tectonics. Therefore, relative tectonic activity was calculated and their values were classified and analyzed in three groups. The low class of Iat is mainly in the sub-basins of 1,7,10,11,16,22,24, 27&28 While the rest of the study area has moderate active tectonics in the sub-basins of 2 ,3 ,4 ,5 ,6 ,8 ,9 ,12 ,13,14,15,17,18,20,21,23,25,26 and high in the sub-basins of 19. Our results show that the moderate value has located along faulted area, which shows 3 class of relative tectonic activity. This study documents active tectonics of Hamedan area, west Iran, for the first time. Abdideh, M., M. Qorashi, K. Rangzan and M. Arian, 2011. Assessment of relative active tectonics using morphometric analysis, case study of Dez River (Southwestern, Iran). Geosciences, 20(80): 33-46. Alizadeh, H., M. Arian, M. Lotfi, M. Ghorashi and M. Ghorbani, 2015. Determination of porphyry copper deposit locations using photo lineament factor in Northern parts of the Dehaj-Sardoiyeh belt. Geosciences, 24(94): 247-252. Arian, M., 2010a. Applied seismotectonics. Tehran: Farazamin Press. pp: 304. Arian, M., 2010b. Earthquake-fault hazard investigations in the Kerman quadrangle. Journal of Sciences, 19(77): 176-182. Arian, M., 2011a. Basement tectonics and geology of Iran. Qum: Asar Nafis Press. pp: 300. Arian, M., 2011b. A preface on salt diapirism of Iran. Qum: AsarNafis Press. pp: 309. Arian, M., 2011c. Middle East tectonics. Qum: Asar Nafis Press. pp: 236. Arian, M., 2012a. Salt diapirism and tectonics. 2nd Edn., Qum: Asar Nafis Press. pp: 319. Arian, M., 2012b. Clustering of diapiric provinces in the central Iran basin. Carbonates and Evaporites, 27(1): 9-18. Arian, M., 2013. Physiographic-tectonic zoning of Iran’s sedimentary basins. Open Journal of Geology, 3(3): 169-177. Arian, M., A. Ahmadnia, M. Qorashi and M. Pourkermani, 2002. Structural analysis of Mengharak transcurrent fault system in Zagros, Iran. Special Geo 2002 Conference Issue Geoarabia, 7 (1) : 209-210. Arian, M. and Z. Aram, 2014. Relative tectonic activity classification in the Kermanshah area. Western Iran. Solid Earth, 5(2): 1277-1291. Arian, M. and N. Bagha, 2012. Active tectonics of Tehran area, Iran. J. Bas. Appli. Sci. Res, 2(4): 3805-3819. Arian, M., N. Bagha, R. Khavari and H. Noroozpour, 2012. Seismic sources and neo-tectonics of Tehran area (North Iran). Indian Journal of Science and Technology, 5(3): 2379-2383. Arian, M. and F. Feizi, 2005. Application of geomorphic indices to the assessment of relative tectonic activity levels in the Alborz-central Iran border zone. Journal of Sciences, 15(57): 378-403. Arian, M. and F. Feizi, 2010. The significance of faulting on the surficial spreading of evaporitic deposits in the Vara-Min-Semnan area. Journal of Earth and Resources, 3(8): 1-20. Arian, M. and A. Hashemi, 2008. Seismotectonic zoning in the Zagros. Journal of Sciences, 8(69): 63-76. Arian, M. and R. Maleki, 2008. Neotectonics. Tehran: Farazamin Research Center. pp: 150. Arian, M., Z. Maleki and H. Noroozpour, 2011. Cenozoic diastrophism and deformational events in the East central Alborz. Journal of Basic and Applied Scientific Research, 1(11): 2394-2400. Arian, M. and H. Noroozpour, 2015a. The biggest salt-tongue canopy of central Iran. Open Journal of Geology, 5(2): 55-60. Arian, M. and H. Noroozpour, 2015b. Tectonic geomorphology of Iran’s salt structures. 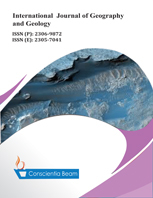 Open Journal of Geology, 5(2): 61-72. Arian, M. and R. Nouri, 2015. Lineament tectonics and mineralization in Tarom area, North Iran. Open Journal of Geology, 5(3): 115-124. Arian, M. and M. Pourkermani, 2001. Rivers morphology and active tectonic (Reviewing the Current Status of Ghezel Ozon River in the Province of Zanjan). 5th Conference of Geological Society of Iran, Tehran, 556. Arian, M. and M. Pourkermani, 2004a. Tectonic elements of South flank in the East-central Alborz Mountain. Journal of Sciences, Teacher Training University, 4(1): 359-368. Arian, M. and M. Pourkermani, 2004b. Structural significance of North Semnan and attary faults in Alborz-central Iran border zone. Journal of Science, 14(53): 4551–4569. Arian, M., M. Pourkermani, M. Qorashi and M. Ghasemi, 2003. North Semnan fault system and its role on basin division. 8th Sym-posium of Geological Society of Iran, Shahrood University of Technology. pp: 11–17. Arian, M., M. Pourkermani, A. Sistanipour and H. Noroozpour, 2011a. Kinematic significance of fold- and fault-related fracture systems in the Rafsanjan’s Northeast Highlands (Central Iran). J. Bas. Appli. Sci. Res, 1(11): 3398-3406. Arian, M., M. Pourkermani, A. Sistanipour and H. Noroozpour, 2011b. Seismicity and fault segmentation of bafq-baghin fault system (Central Iran). Journal of Applied Environmental and Biological Sciences, 1(10): 382-396. Arian, M. and M. Qorashi, 2006. The movement potential evaluation of the major quaternary faults in Alborz-central Iran border zone, from the East of Tehran to the East of Semnan. Journal of Geosciences, Geological Survey of Iran, 15(59): 184-188. Arian, M., M. Qorashi, M. Pourkermani and A. Ahmadnia, 2003. Fractal analysis of Mengharak transcurrent fault system in Zagros, Iran. Abstracts of Fourth International Conference on Seismology and Earthquake Engineering, Iran, 23. Arian, M., M. Qorashi, M. Pourkermani and A. Ahmadnia, 2006. The structural significance kareh bas transcurrent fault system in the Zagros fold and thrust belt. Journal of Geosciences, 15(58): 126-133. Arian, M., V.H. Toudeshki and H. Noroozpour, 2011. Active tectonics of Qezel Ozan River Basin, NW Iran. Journal of Applied Environmental and Biological Sciences, 1(9): 291-295. Asadian, F. and M. Arian, 2009. Identification of diapiric provinces of central Iran through geological and geographical analysis. International Journal of Agriculture Environment & Biotechnology, 2(1): 3443-3451. Asadian, F., M. Pourkermani and M. Arian, 2007. Tectonic geomorphology of salt structures in the Garmsar- Lasjerd area. Geographical Research, 39(60): 75-84. Bagha, N., M. Arian, M. Ghorashi, M. Pourkermani, R. El Hamdouni and A. Solgi, 2014. Evaluation of relative tectonic activity in the Tehran Basin, Central Alborz, Northern Iran. Geomorphology, 213(1): 66-87. Bagha, N., M. Ghorashi, M. Arian, M. Pourkermani and A. Solgi, 2015. Neotectonic analysis of Mosha-North Tehran fault zone, based on morphotectonic features, central Alborz, Northern Iran. Geosciences, 24(94): 41-52. Baharvand, S., M. Pourkermani, R. Ajalloian, M. Arian and A.R. Nouryazdan, 2010. Seymareh landslide and its role in environmental and geomorphologic changes of the Pole-Dokhtar area. Journal of the Earth, 4(4): 13-24. Bahiraee, S., M. Arian, M. Qorashi and M. Solgi, 2015. The movement potential evaluation of the Mosha fault (The West of Firoozkuh to the Shahrestanak). Geosciences, 24(94): 123-126. Brönnimann, P., L. Zaninetti, F. Bozorgnia, G.R. Dashti and A. Moshtaghian, 1971. Lithostratigraphy and foraminifera of the upper triassic Naiband formation, Iran. Revue de Micropaléontologie, 14(4): 7-16. Bull, W.B., 2007. Tectonic geomorphology of mountains: A new approach to paleoseismology. Malden: Blackwell. Bull, W.B. and L.D. McFadden, 1977. Tectonic geomorphology North and South of the Garlock fault, California. In: Doehring D.O. (Eds). Geomorphology in arid regions. Proceedings of the Eighth Annual Geomorphology Symposium. State University of New York, Binghamton. pp: 115-138. Dehbozorgi, M., M. Pourkermani, M. Arian, A.A. Matkan, H. Motamedi and A. Hosseiniasl, 2010. Quantitative analysis of relative tectonic activity in the Sarvestan area, central Zagros, Iran. Geomorphology, 121(3): 329-341. El Hamdouni, R., C. Irigaray, T. Fernandez, J. Chacon and E.A. Keller, 2008. Assessment of relative active tectonics, Southwest border of Sierra Nevada (Southern Spain). Geomorphology, 96(4): 150-173. Eshghi, Z., M. Arian and M. Pourkermani, 2012. Structural investigation on the lak mining area (Bueen Zahra) based on remote sensing, used for its mineralization. Journal of The Earth, 6(22): 145-155. Farrokhnia, A.R., S. Pirasteh, M. Pourkermani and M. Arian, 2011. Geo-Information technology for mass wast-ing hazard zonation: Central-West Alborz-Iran. Disaster Advances, 4(3): 24-33. Feizi, F., A. Arian and R. Rahmani, 2007. Seismotectonic zoning in the Eastern part of the central Alborz. Journal of Sciences, 17(65): 151-164. Feizi, F. and M. Arian, 2006. The classification of thrust fronts in the Alborz-central Iran border zone from the East of varamin to the East of Semnan. Journal of Sciences, 16(61): 75-87. Feizi, F. and M. Arian, 2011. The role of structural controllers in geneses of copper deposits in 1:50000 map of Saiin Qaleh. Journal of Sciences, 21(81): 1-10. Hack, J.T., 1973. Stream-profiles analysis and stream-gradient index. Journal of Research of the U.S. G.S, 1(2): 421-429. Housini Toudeshki, V. and M. Arian, 2011. Morphotectonic analysis in the Ghezel Ozan River Basin, NW Iran. Journal of Geography and Geology, 3(1): 258-260. Housini Toudeshki, V., M. Pourkermani, M. Arian and K.H. Khosrotehrani, 2011. Influence of structures on the Ghezel Ozan River. Geosciences, 21(81): 55-60. Jamalian Daryani, N., M. Arian and N. Rashidnezhad Omran, 2015. Tectonics and mineralization of copper in the Ar-Destan-Kahang area, central Iran by remote sensing. Open Journal of Geology, 5(4): 188-196. Javadi Mosavi, E. and M. Arian, 2015. Neotectonics of Tabas area, central Iran by index of active tectonics (IAT). Open Journal of Geology, 5(4): 209-223. Javadi Mosavi, E., M. Arian, M. Ghorashi and M. Nazemi, 2012. Measurments of geomorphic indices in Tabas area. Journal of the Earth, 7(24): 213-225. Keller, E. and N. Pinter, 2002. Active tectonics: Earthquakes, uplift, and landscape. New Jersey: Prentice Hall. pp: 432. Khavari, R., M. Arian and M. Ghorashi, 2009. Neotectonics of the South central Alborz drainage basin, in NW Tehran, N Iran. Journal of Applied Sciences, 9(23): 4115-4126. Khavari, R., M. Ghorashi and M. Arian, 2009. Assessment of relative active tectonics, South central Alborz (North Iran). EGU General Assembly Conference Abstracts, 11:1137. Khavari, R., M. Ghorashi, M. Arian and K. Khosrotehrani, 2010. Geomorphic signatures of active tectonics in the karaj drainage basin in South central Alborz, N, Iran. Geosciences, 19(75): 67-74. Mardani, Z., M. Ghorashi and M. Arian, 2011. Geomorphic signatures of active tectonics in the Talaghan Rud, ShahRud and sefidrud drainage basins in central Alborz, N Iran. Geosciences, 20(78): 159-166. Mashal, M., M.P. Kermani, A. Charchi, M. Almasian and M. Arian, 2013. Pattern of structural geology underground in Eastern of North Dezfol embayment. Advances in Environmental Biology, 7(2): 260-268. Moghimi, H., M. Arian and A. Sorbi, 2015. Fault movement potential of Marzanabad area, North Alborz, Iran. Open Journal of Geology, 5(3): 126-135. Molin, P., F.J. Pazzaglia and F. Dramis, 2004. Geomorphic expression of active tectonics in a rapidly-deforming fore arc, sila massif. Calabria, Southern Italy. American Journal of Science, 304(4): 559-589. Nouri, R., P. Afzal, M. Arian, M. Jafari and F. Feizi, 2013. Reconnaissance of copper and gold mineralization using ana-lytical hierarchy process in the Rudbar 1: 100,000 map sheet, Northwest Iran. Journal of Mining and Metallurgy, 49(1): 9-19. Nouri, R., M.R. Jafari, M. Arian, F. Feizi and P. Afzal, 2013a. Correlation between cu mineralization and major faults using multifractal modelling in the Tarom area (NW Iran). Geologica Carpathica, 64(5): 409-416. Nouri, R., M.R. Jafari, M. Arian, F. Feizi and P. Afzal, 2013b. Prospection for copper mineralization with contribution of remote sensing, geochemical and mineralographical data in Abhar 1:100,000 sheet, NW Iran. Archives of Mining Sciences, 58(4): 1071-1084. Pazhoohan, M., M. Arian, M. Ghorashi and K. Khosrotehrani, 2014. A study of drainage pattern responses to active tec-tonics in Tadvan region‚ SW Iran. Geodynamics, 1(2): 36-41. Poroohan, N., M. Poukermani and M. Arian, 2009. An assessment on correlations of seismotectonic parameters preceding and following Roudbar-Manjil Earthquake (Gilan, North of Iran). Australian Journal of Basic & Applied Sciences, 3(4): 2643-2652. Poroohan, N., M. Pourkermani and M. Arian, 2013. An assessment of relationship in F-parameter and paleostress fields in heterogeneous lithologies: Roudbar area (Northwest of Iran). Australian Journal of Basic & Applied Sciences, 7(2): 933-942. Pourkermani, M. and M. Arian, 1997a. Salt domes of central Iran. Journal of Humanities, 3(2): 29-41. Pourkermani, M. and M. Arian, 1997b. Seismotectonics. Tehran: Dez Ab Consulting Engineers Company Press. pp: 270. Pourkermani, M. and M. Arian, 1997c. Salt domes of central Iran. Journal of Humanities, 3(2): 29-41. Pourkermani, M. and M. Arian, 1998a. Tectonic geomorphology of salt domes in West of Zanjan province, Iran. Geographical Research, 47: 44–53. Pourkermani, M. and M. Arian, 1998b. Seismicity of Iran. Tehran: Shahid Beheshti University Press. pp: 212. Pourkermani, M. and M. Arian, 2001. Structural geomorphology of Northeastern Kurdistan. Journal of Humanities, 7(16): 37-48. Qorashi, M. and M. Arian, 2011. Tectonics of Iran. Tehran: Geologic Survey of Iran. pp: 336. Rahimi, N. and M. Arian, 2014. Tectonic geomorphplogy of Hamedan-Sosangerd region, West Iran. Advances in Environ-mental Biology, 8(24): 119-124. Rockwell, T.K., E.A. Keller and D.L. Jonson, 1985. Tectonic geomorphology of alluvial fans and mountain fronts near Ventura, California. In: Morisawa, M. (Eds). Tectonic geomorphology. Proceedings of the 15th Annual Geomorphology Symposium. Allen and Unwin Publishers, Boston. pp: 183-207. Silva, P.G., J.L. Goy, C. Zazo and T. Bardajm, 2003. Fault generated mountain fronts in Southeast Spain: Geomorphologic assessment of tectonic and earthquake activity. Geomorphology, 250: 203-226. Sorbi, A., M. Arian and M. Pourkermani, 2009. The movement potential evaluation of the major quaternary faults in Tehran quad-rangle. Journal of the Earth, 19(73): 176-182. Sorbi, A., M. Arian and M. Pourkermani, 2011. The application of geomorphic indices to the assessment of relative tectonic activity levels in Tehran quadrangle. Journal of the Earth, 6(20): 1-9. Wells, S.G., T.F. Bullard, T.M. Menges, P.G. Drake, P.A. Karas, K.I. Kelson, J.B. Ritter and J.R. Wesling, 1988. Regional variations in tectonic geomorphology along segmented convergent plate boundary. Geomorphology, 1(4): 239-265.